Yes, the number of limited edition Off-Shore models is almost as pathetic – perhaps even worse – as the number of Omega Speedmaster Professional variations, but it seems that brands still feel that there is a market for them. However, there is this specific limited edition Royal Oak Off-Shore – of 300 pieces – that catched my interest last year already (read about it here), the Montauk Highway watch. During my visit to New York last May, I paid the Audemars Piguet boutique on East 57th street a visit and they happened to have one on display. I could finally see it in the flesh, as Audemars Piguet dealers are very rare here in The Netherlands. The nice sales manager let me fiddle around with it a bit and realized very quickly that I wasn’t a potential buyer, but merely an AP-adept. 🙂 Which was OK for her as well. Sadly, most of the time when you are not buying they lose interest very quickly and can become rude. At least in this boutique they understand that I might be coming back when I hit jack pot. Anyway – I am fully aware that I am drifting away from the Montauk Highway watch -, this watch made a huge impression on me, although the dial colors could be considered a bit too playful to keep interest in this watch. 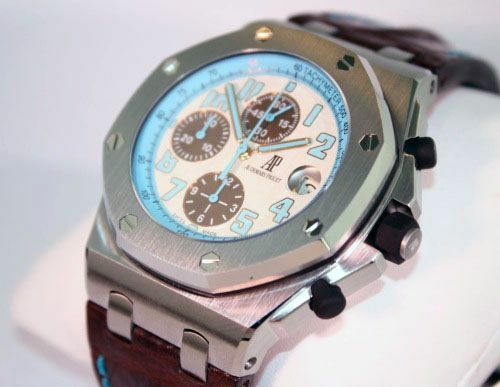 Due to the fact that there were only 300 available of these watches, and only for the official Audemars Piguet boutiques in the United States (Florida and NY), I didn’t expect them to pop up here at a watch dealer in The Netherlands. 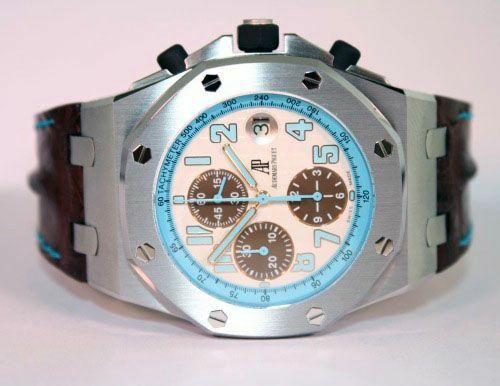 Interwatches has a NIB (New In Box) Montauk Highway up for sale, with a price tag of 16.950 euro. That’s approximately as much as the three others I see for sale via Chrono24. However, Europeans who want to have a Montauk Highway special should not forget about taxes, customs and so on when they buying a watch from overseas. Click here to see all the details of this watch over at Interwatches. Photos courtesy of Interwatches.